Domaine du Vieux Telegraphe is one of the better known names in Chateauneuf du Pape. The Brunier family has been producing wines in the Southern Rhone Valley for over 100 years. Vieux Telegraphe was founded in 1898 by Hippolyte Brunier, the great, grandfather of the current owners. At the time the estate was founded, only 1 hectare of vines was cultivated with grapes. The remaining land was used for growing fruit and vegetables, which in those days, made a lot more money than grapes used for wine. They chose the name Vieux Telegraphe from an aging signal tower built in 1792 by Claude Chappe. Chappe is the inventor of the optical telegraphe, so as you can see, Vieux Telegraphe is a very fitting name. The first vintage to be produced and bottled at Vieux Telegraphe was the 1900. Henri Brunier took over managing Vieux Telegraphe by the late 1940’s. It was Henri Brunier that was responsible for expanding their vineyards and promoting the brand outside of France. Beginning in 1988, the sons of Henri Brunier, Frederic Brunier and Daniel Brunier, took over management of Vieux Telegraphe. The best vintages of Domaine du Vieux Telegraphe are: 2018, 2017, 2016, 2015, 2012, 2010, 2009, 2007, 2006, 2005, 2001, 2000, 1998, 1990, 1989 and 1978. Domaine du Vieux Telegraphe owns 60.5 hectares of vines located in Chateauneuf du Pape. One of the largest land holders in the Chateauneuf du Pape appellation, they use 54 hectares for the production of red wine. 6.5 hectares are used to to grow white wine grapes. The best parts of the Vieux Telegraphe vineyards are situated in the La Crau sector, with its terroir of very, rocky soils with small pebbles, stones, red clay and sand. 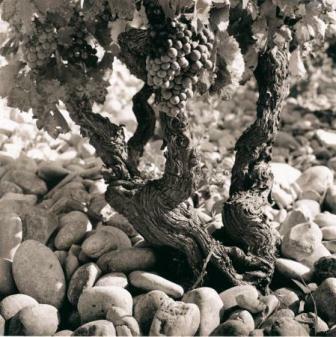 In fact, the surface of the vineyard is made from pure rocks and stones. It’s amazing to see! Domaine du Vieux Telegraphe produces 2 red Chateauneuf du Pape wines and 2 Chateauneuf du Pape white wines. Domaine du Vieux Telegraphe is the flagship wine of Les Vignobles Brunier. Vieux Telegraphe is always produced from the estates oldest vines. 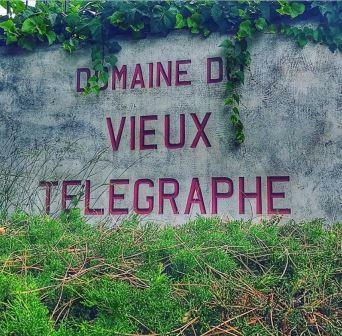 Vieux Telegraphe comes from fruit planted in La Crau with a terroir that as we said, is littered with nothing but various, large and small rocks and stones in the soil. The vineyard is one of the largest with contiguous parcels in the La Crau lieu-dit. Vieux Telegraphe is usually a blend of 65% Grenache, 15% Mourvedre, 10% Cinsault and 10% Syrah. Although the blend can vary, depending on the character of the vintage. The production of Vieux Telegraphe remains traditional. The grapes are destemmed in the majority of cases, which comes out to being close to 60% or more of the harvest most of the time. One consideration they are concerned with is, if destemming could break the skins. If the skins are fragile, that impacts the amount of destemming they would perform that vintage. The grapes are hand harvested and moved by gravity flow into the vatting room for fermentation where the young and old vines are separated and placed into short, 100 hectoliter, oak tanks for maceration and fermentation. While fruit younger than 25 years is fermented separately from older vines, all the varietals are fermented in the same vats. Next, the wine is moved into concrete vats for 9 months before their being aged in 70 hectoliter foudres. Le Telegramme is a blend of 90% Grenache with 10% Mourvedre. Le Telegramme is made predominantly from the estate’s youngest vines, which are on average close to 40 years of age. The wine is aged in vat and foudres for 15 months before bottling. Prior to the 2002 vintage, Le Telegramme was named Vieux Mas de Papes. Domaine du Vieux Telegraphe Blanc is made from a blend of 40% Clairette, 30% Grenache Blanc, 15% Roussanne and 15% Bourboulenc. 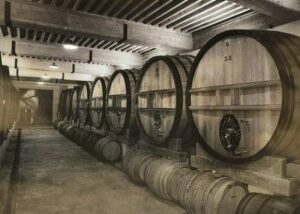 The wine is aged in a combination of foudres, demi muids and new, French oak barrels for 9 months. The production is close to 2,000 cases per year. Domaine du Vieux Telegraphe Le Telegramme Blanc is produced for the American market. The wine is a blend of 40% Roussanne, 30% Grenache Blanc, 20% Bourboulenc and 10% Picpoul. The wine is aged in tank for 7 months. The production is limited to about 350 cases per year. Domaine du Vieux Telegraphe is a wine that shows truly better wine age. Young vintages can be decanted for about 1-3 hours, give or take. This allows the wine to soften and open its perfume. Older vintages might need very little decanting, just enough to remove the sediment. Domaine du Vieux Telegraphe is usually better with 4-6 years of bottle age. Of course that can vary slightly, depending on the vintage. In the best vintages the wine should be consumed within 8-25 years after the vintage. Domaine du Vieux Telegraphe is best served at 15.5 degrees Celsius, 60 degrees Fahrenheit. The cool, almost cellar temperature gives the wine more freshness and lift. Domaine du Vieux Telegraphe is best served with all types of classic meat dishes, veal, pork, beef, lamb, duck, game, roast chicken, roasted, braised, stewed dishes, sausage, barbecue and cassoulet. Domaine du Vieux Telegraphe is also good with Asian dishes, hearty fish courses like tuna, mushrooms pasta, eggplant, tomatoes and cheese. The white wine of Domaine du Vieux Telegraphe is best served with a myriad of different seafood dishes, shellfish, crab, lobster, sushi, sashimi, chicken, pork and veal, as well as Asian cuisine. The Brunier family also own another vineyard in the Chateauneuf du Pape appellation, la Roquete, which produces “Piedlong”. In addition, Domaine Vieux Telegraphe has vines in the Gigondas appellation where they own Domaine les Pallieres in a partnership with Kermit Lynch, the well-known American importer. Les Pallieres makes 2 wines, les Racines, which comes from their oldest vines and Terraces de Diable, which is produced from vines located on the limestone terraces in the appellation. Their Le Vieux Telegraphe Pigeoulet de Brunier is a Vin de Pays that comes from unclassified vines in the Vaucluse appellation and is made with both red wine grapes and white wine grape varieties. In the Cotes du Ventoux they produce Vieux Telegraphe Megaphone. The industrious Brunier family also makes wine in the Bekaa Valley of Lebanon with Massaya. Silky, ripe, sweet and fresh, the wine offers a classic, elegant profile of Grenache, with a focus on its ripe, sweet, cherry core of fruit. Soft polished, long, fresh and pure, the wine is not about power. Instead, what you have is an elegant, fresh sweet expression of fruit. Produced from a blend of 65% Grenache, 15% Syrah, 15% Mourvedre and 5% Cinsault. Elegant, refined, forward, medium bodied and focused on its red fruits and silky textures, over concentration and power. This charmer is already quite taste and easy to drink. Medium bodied, soft, elegant, fresh and forward, there is good sweetness ad purity to the red fruits, with quite a bit of lift, and an earthy, floral note to complicate matters. This is already showing well, and while it should improve with age, if you like then young, go ahead and pop a cork. Light in style, easy drinking, forward, medium bodied, softly textured and with, sweet, red cherries and raspberries from start to finish, this is fully ready for near term drinking. This would be a nice find on a restaurant list. Really strong for the vintage, there is wealth of black raspberries, herbs and kirsch, paired with silky smooth textures and a fresh, sweet, peppery, kirsch finish. Produced from a blend of 65% Grenache, 15% Syrah, 15% Mourvedre and 5% Cinsault. Wild strawberry with herbs, smooth tannins and a soft, short and sweet, fresh, cherry note in the finish. The wine was made using a blend of 80% Grenache, 10% Syrah, 6% Mourvedre and 4% Cinsault. Medium/full bodied, fresh, bright, lively wine which is still young and a little tight. With air, and effort, the kirsch, black raspberry, tapenade, thyme and garrigue began to develop and show itself. This needs a few more years in the bottle. Medium bodied, forward and quite easy to taste today. The elegant, fresh kirsch, garrigue, peppery strawberry and olive character is already coming through loud and clear. Not a wine to age, this is perfect for early drinking pleasure. With ripe, juicy, red plum, black raspberry, pepper, earth and green olive notes, this full bodied, concentrated, beefy Southern Rhone has a lot to offer. With time, when the tannins soften and the wine evolves, this should offer a much better tasting experience. Youthful, medium bodied, fresh, dominated by its cherry and garrigue nose, the wine is well made, but it lacks that extra special something that really carries through. Dark ripe berries, cherry, jam and spicy aromatics open to a lush, forward styled Chateauneuf du Pape with the structure to age and ample, soft, ripe, red fruits that make it fun to drink today. Tight and hard to get a handle on, with air and intense swirling, spicy black cherry aromatics could be found, Medium bodied and bright, the strawberry filled finish felt light and short. This is not a bad wine. It just lacked excitement. Concentrated, tannic and structured, this classic styled wine has a core of fresh, peppery, red berries, earth and herbs. A few more years should help the wine develop more nuances. Strong wine here, with ample ripe dark red fruits, spice, garrigue, jam and kirsch. The wine is rich, round and full bodied, leaving with a finish packed with fresh red and black cherries. Medium bodied, fresh, lively, earthy, kirsch, black cherry and herbs are right where they need to be in the nose, and on the palate. You can definitely enjoy this wine with pleasure. Avoiding the jammyness that afflicts so many wines from the vintage, you find ample amounts of spice, licorice, pepper, garrigue and red fruits. Soft, supple, round and easy to drink, this is definitely ready to go. Strawberry, kirsch and earth, rustic and peppery, full bodied and structured, this can be drunk now or held for potential further development. So much better than the previous bottle, tasted years ago. This is a beauty! All the sweet, juicy kirsch, peppery, black raspberry, earth, herbs and weight, density, length and complexity you could ask for in a Chateauneuf du Pape. Dark ruby color with earthy, tar, jammy black fruit and fresh cracked pepper scents. Concentrated, dense but without any special reason to like the wine. At the end of the day, it was dull. Medium weight, simple and boring. Based on the vintage, this fully mature Chateauneuf du Pape is showing much better than expected. Medium bodied, and lacking the intensity of a great vintage, the red berries are fresh, clean feminine. This is not a wine to hold. Vegetative aromas with green pepper, herbs, mushrooms and white pepper scents. Full bodied with a slightly chalky bitter finish. Some fruit, but mostly disappointing. Compelling and eternally youthful, at close to 40, this certainly competes with any Southern Rhone for the wine of the vintage. The nose grabs you with its sweet, deep, red fruits, black pepper and garrigue. Full bodied, wild and long, the finish sticks with you, with its layers of ripe, peppery, dark red berries. Filled with fresh cracked pepper, gariggue, kirsch, herbes, fennel and black raspberries with a melange of spice, this rich, full bodied, charmingly, rustic, spice filled wine ends with a long, fresh, powerful, pure, cherry liqueur finish. This fully mature Chateauneuf du Pape remains a sublime tasting experience for lovers of old Chateauneuf du Pape. Believe it or not, this has at least another decade of life to look forward to. This is best vintage of Vieux Telegraph I’ve ever tasted! It's almost impossible to fathom how young this wine was showing after more than 3 decades of aging. From the color, aromatics and taste, I would have thought this wine was at least 10 years younger. The perfume blended garrigue with dark cherries, pepper and earth. The finish was long, clean and pure. While the wine did not improve with air, it remained at the same level for 2 hours. This might be one of the best 78 Chateauneuf du Papes available today.